Thank you to everyone who joined Cancer Services for an evening of laughs! We had a blast and were able to raise more than $30,000 to help local people with cancer receive the support they need. Please enjoy some of our favorite photos from photographer Jeremy Garner of JBG Photography. Thank you again, and see you next year! Hold on to your grocery lists! Help support local people with cancer when you shop at Kroger during “Fight Cancer Day” on Wednesday, Oct. 3 and throughout the month of October. 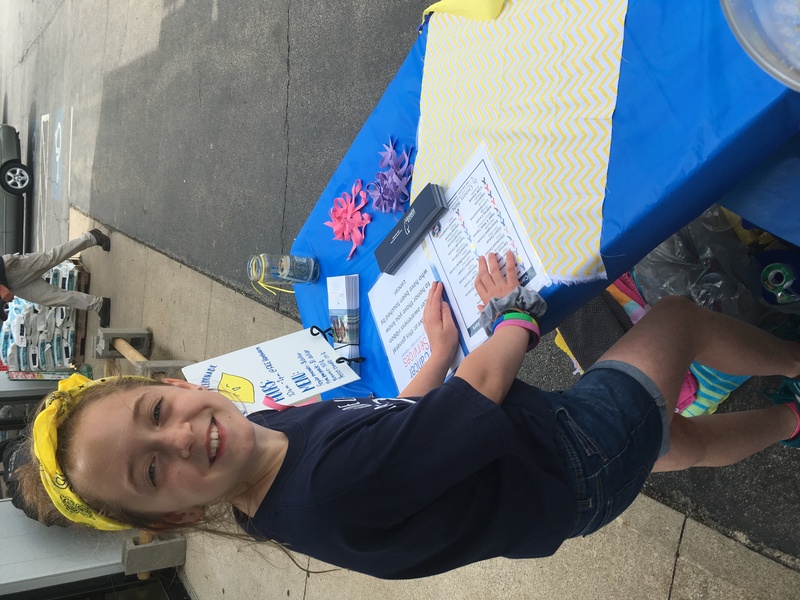 On Wednesday, three percent of all sales across 17 Northeast Indiana Kroger stores will be donated to Cancer Services of Northeast Indiana, the American Cancer Society and Francine’s Friends. You can also make a donation in the increments of $1, $3 or $5 at check-out throughout the month of October. Don’t forget you can support Cancer Services all year round with your Kroger Plus Card. Click here to learn how. Tickets are now on sale for $15, and can also be purchased at the door. All ticket proceeds will benefit Cancer Services. Go to www.summitcitychorus.org for more information. Hope to see you there! 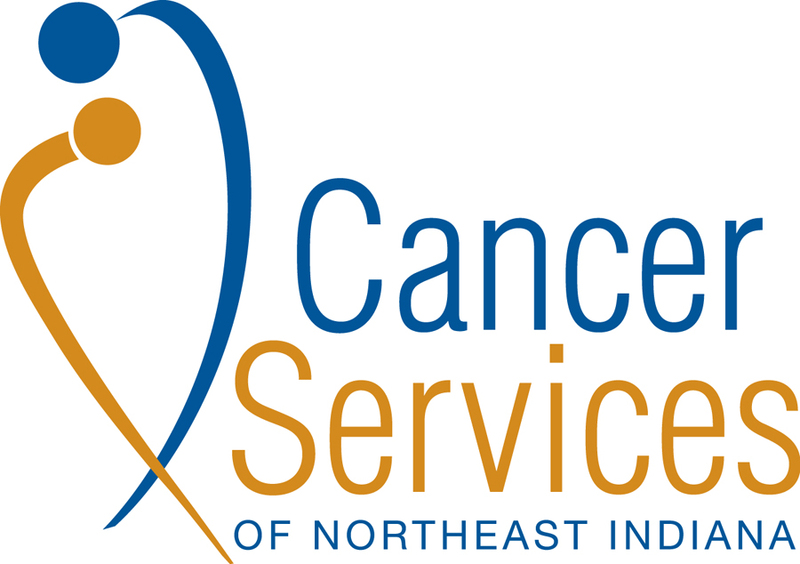 Cancer Services of Northeast Indiana is hiring an Outreach Coordinator. This is an opportunity to work for a great organization that helps thousands of people each year. Cancer Services of Northeast Indiana is expanding our integrated services with new options in Wellness Therapy Sessions. Craniosacral Therapy is a gentle hands-on method that supports every system in the body, releasing tension and enhancing your body’s own ability to heal. Reiki is a Japanese word meaning “universal life force energy”. It addresses both chronic and acute conditions, gently and powerfully promoting balance among all the body’s systems. BodyTalk improves communication in the whole body-mind by redirecting the body’s natural healing ability through tapping. This brings optimal balance and communication to all cells and systems. All sessions are done fully clothed while lying on a massage table. Clients and caregivers can schedule a time and then choose the wellness therapy they want when they come in for the session. Call 260.484.9560 or 866.484.9560 today for an appointment for a unique experience in wellness! Supporters like you are creating opportunities to ensure people touched by cancer in our community receive the resources and services they need. It is our hope you will join us in supporting their tremendous efforts. 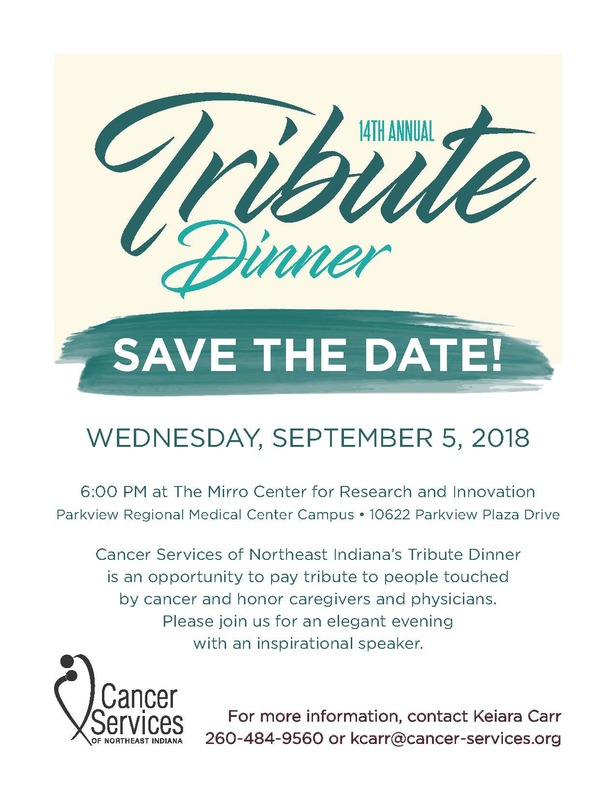 We continue to be appreciative of the support from our community, and would be so delighted to know if you are planning an upcoming event in support of Cancer Services of Northeast Indiana. Please give us a call at 260-484-9560. When: Registration is at 7 a.m. June 19, 2018; tee-off at 8 a.m. Cost: Entry is $75 per lady golfer or $300 per team. Registration deadline is June 8. For more information, call the Cobblestone Pro Shop, 260-349-1550. This event features breakfast, lunch, a raffle and all-around good time! 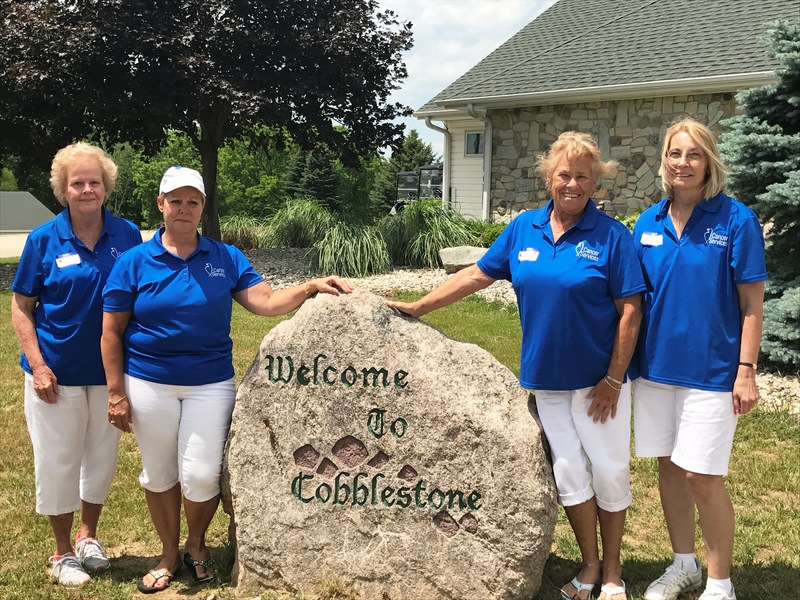 Cancer Services would like to thank the Cobblestone Ladies Golf Association, who work tirelessly to raise funds in support of local people touched by cancer. 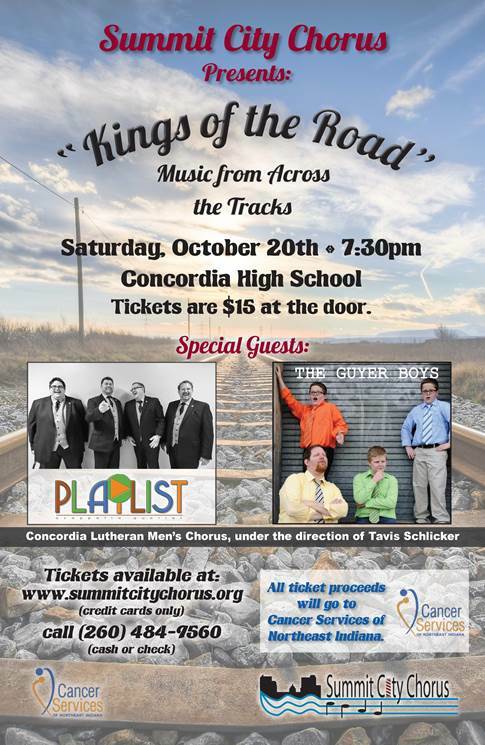 Cost: Tickets are $20 each; $30 at the door; click here to purchase tickets. Norm Newman’s birthday. The event’s proceeds will be benefit Cancer Services of Northeast Indiana and Turnstone. Live music by The Snyder’s and Acme Blues Band. Cost: $65 per person scramble format – shotgun start with four persons per team; checks should be made payable to Noble Hawk Golf Course and turned in with sign up sheet to Noble Hawk Golf Course or to Nick Pentsos, nick.pentsos@kandkinsurance.com; all teams must be registered by Friday, July 1. This event is in memory of Mike Woodward and his family is generously donating the proceeds to Cancer Services for the 3rd year! So, if you enjoy golf and like to help others while doing so, please consider attending this event. For more information, call 260-347-2071. 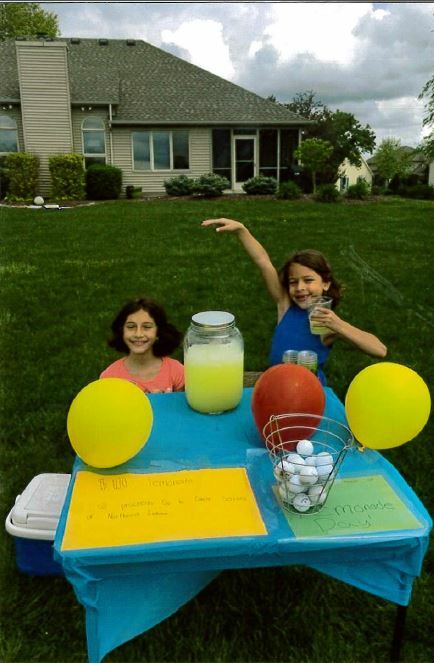 Lemonade Day is a national youth entrepreneurship program that teaches young people how to start, own and operate their own businesses through setting up a lemonade stand. 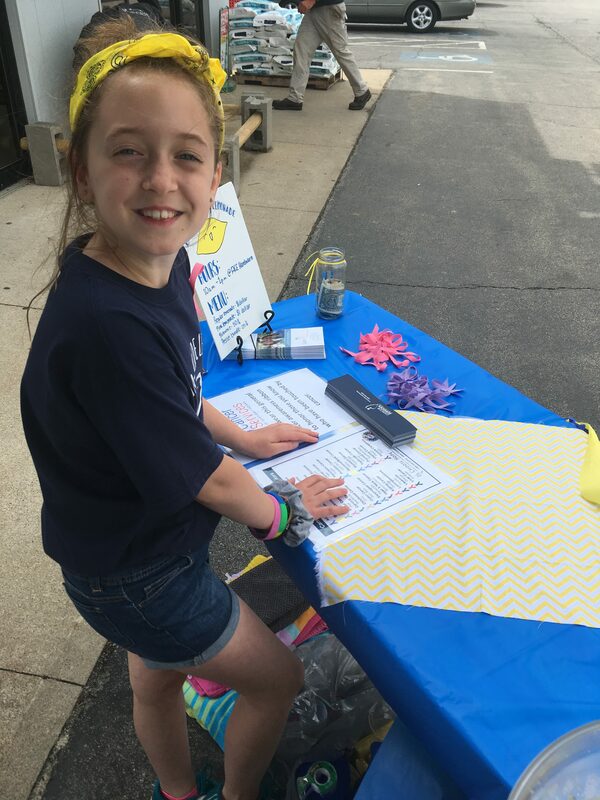 The community-wide Lemonade Day took place on May 19, and three young entrepreneurs decided to donate their profits to Cancer Services. Thank you to Brenna Meyer and Maris and Milena Williams for your incredible display of generosity! 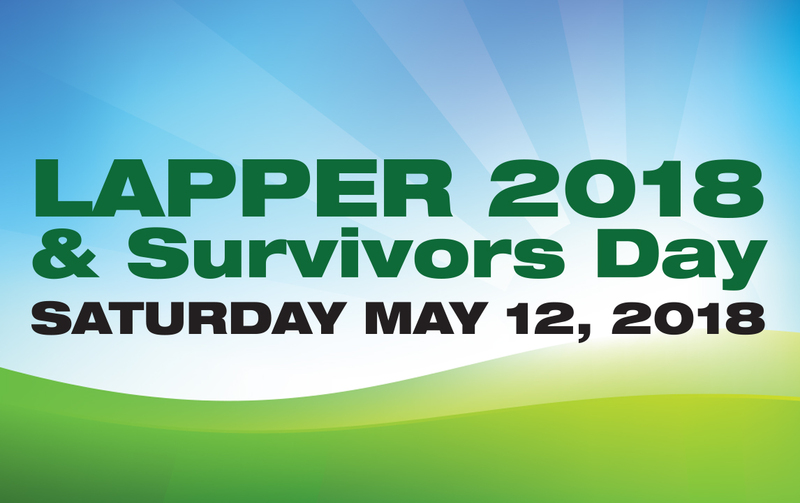 We are less than a month away from the 2018 Lapper and Survivors Day Celebration on May 12, 2018, and it is our hope you will join us to honor and memorialize local people touched by cancer. 11 AM – Survivors Day Celebration featuring food and fun for the entire family! Visit lapper2018.everydayhero.do. To register for Lapper 2018 , click “Register and Fundraise.” Once you have confirmed your online registration, you will be able to create a team or join an existing team from your fundraising page. If you prefer to register via pen and paper, please visit Cancer Services, 6316 Mutual Drive, to pick up a participant brochure. Raise $35 by May 1 to receive a commemorative Lapper t-shirt. This year’s theme acknowledges how a community of supporters have come together for more than 16 years to help local people touched by cancer through the Lapper fundraising walk. Our roots grow deep. Parking will be available throughout the Brotherhood Office Park. There will be parking coordinators and signage to help you find a spot! The walking trail is slightly less than a mile. While you are more than welcomed to take more than one lap, it really is your decision! The Survivors Day Celebration featuring food, games, and music for the entire family will begin at 11 a.m. Follow Cancer Services on Facebook for more Lapper updates, and let us know if you will be joining us on our Facebook event page! The Lapper is a fundraising walk for Cancer Services to honor or memorialize a loved one touched by cancer. After the walk, we come together for the Survivors Day Celebration featuring food, music and fun for the entire family! Start fundraising on your own or create a team to join you for the Lapper walk on May 12, 2018. 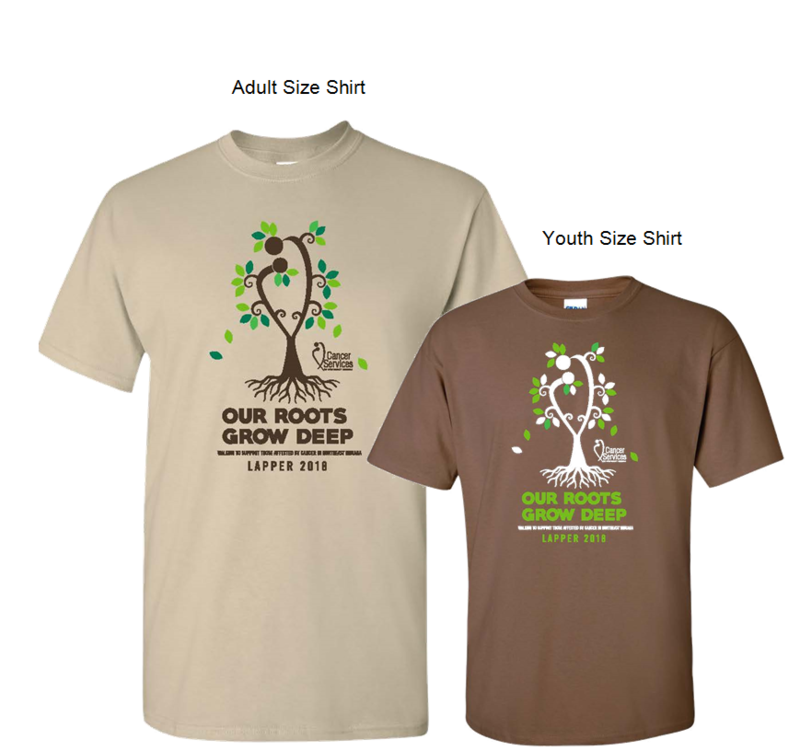 Raise $35 by May 1 to receive a commemorative t-shirt. Start fundraising today at lapper2018.everydayhero.do, or click the header above. $50 can provide one wig for a client who has lost their hair due to treatment. $100 can provide one month of nutritional supplement for a client undergoing chemotherapy. $250 can provide four oncology massages from one of Cancer Services’ certified oncology massage therapists. $500 can provide financial assistance to a client paying for nausea and pain medicine. $1,000 can ensure a client receives a year of practical and emotional support. Whether you’re picking up a gallon of milk or need a whole week’s worth of groceries, you can take advantage of the Kroger Community Rewards program and help people with cancer while you shop. 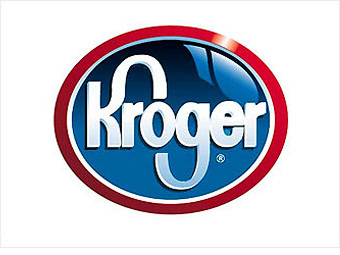 Kroger rewards Cancer Services with a quarterly donation when our supporters select us as their charity of choice and use their Kroger Plus Card to shop. 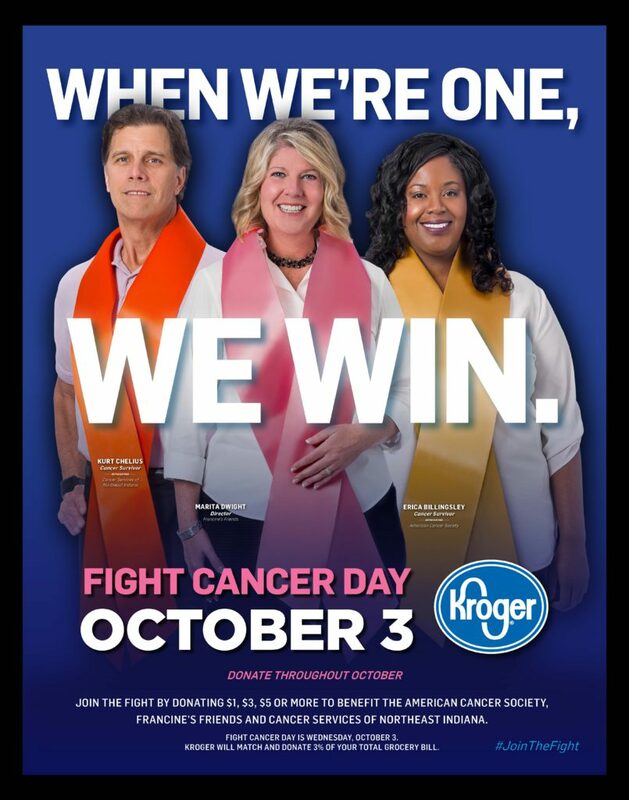 Click on Create an Account (If you already have a Kroger Plus card, but are not an online customer) or click on Sign in (If you are an online customer already and just want to designate Cancer Services as your charity of choice. Cancer Services’ organization number is 11230. Please pass this information along and encourage your family and friends to enroll as well! 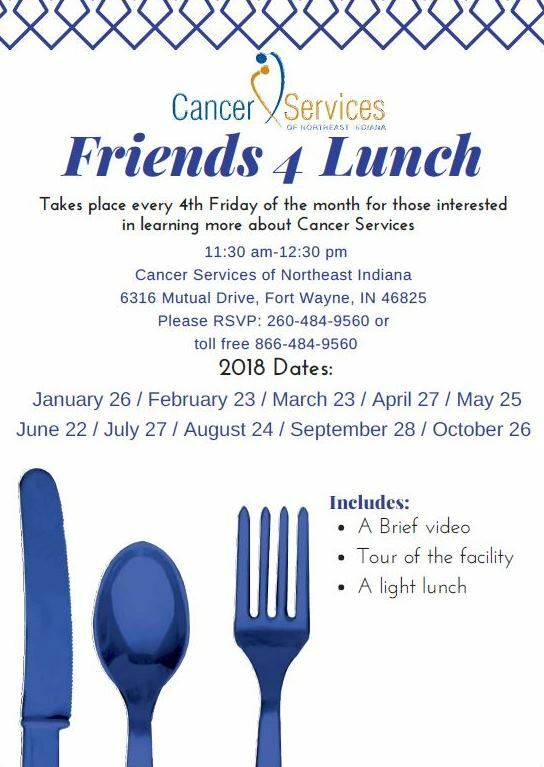 Friends 4 Lunch is an opportunity for those interested in learning more about Cancer Services. It includes a brief video, a tour of our building and a light lunch. We host the lunch every fourth Friday of the month from 11:30 a.m. to 12:30 p.m., and we would be happy to reserve a space for you and friends. To RSVP , please call 260-484-9560 or toll free 866-484-9560. 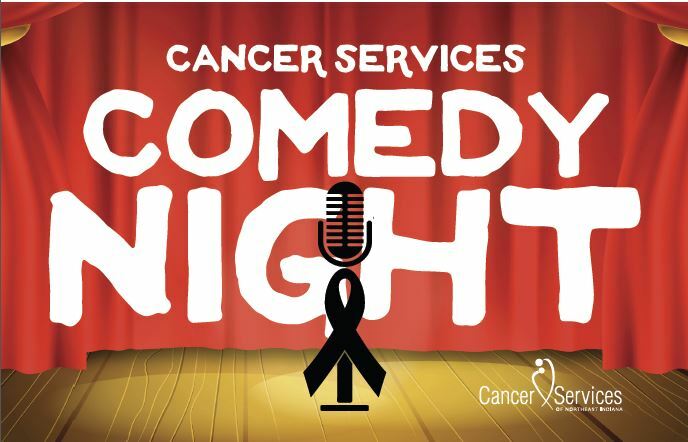 Please join Cancer Services for Cancer Services Comedy Night, 7 p.m. Saturday, February 24 at Sweetwater, 5501 US-30, Fort Wayne, IN 46818. 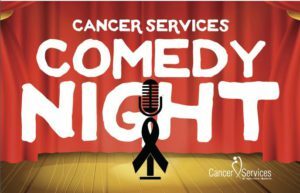 Cancer Services Comedy Night will feature hors d’oeuvres, cash bar, a friendly joke competition, and stand-up comedian Michael Palasak to top off the night. Michael Palascak was a finalist on NBC’s “Last Comic Standing,” and has appeared on the “The Late Show,” “The Tonight Show,” and “Conan.” He also has a half-hour special on Comedy Central. Tickets are $50 per person and $75 per person for VIP. VIP tickets include one free drink ticket and a meet and greet with Michael Palascak. Tickets are limited. Purchase your tickets online here or visit our office at 6316 Mutual Drive, Fort Wayne, IN 46825. For more information, please call Keiara Carr at 260-484-9560. Click here to view the items up for auction at the 2017 Design on Life Spring Auction, 6:30 p.m. February 25, 2017 at Ceruti’s Diamond Room. We are still adding unique items and experiences to the website, so please check back regularly to add more items to your wish list. The 14th Annual Design on Life Spring Auction will bring the essence of the French Riviera with a full evening of live and silent auctions, hors d’oeuvres, cash bar, live entertainment by Dan Heath and the Paradise Trio. The evening will also feature a new card game where participating guests get a chance to win a fabulous prize. Cancer Services’ Design on Life Auction has been held as a prelude to the Fort Wayne Home and Garden Show since 2004, raising more than $460,000 to help families in our community that are touched by cancer. Individual tickets are $50; $600 for a Reserved Table of 10. Each event ticket purchased includes a complimentary ticket to the Fort Wayne Home and Garden Show. Purchase tickets online at: Design on Life Tickets. For more information about the event, including sponsorship opportunities, contact Keiara Carr at kcarr@cancer-services.org or call (260)484-9560. Join the party for Monte Carlo Night! The 14th Annual Design on Life Spring Auction will bring the essence of the French Riviera to Ceruti’s Diamond Room on February, 25, 2017 at 6:30 p.m. The evening features hors d’oeuvres, cash bar, a new game, entertainment by The Paradise Trio and the opportunity to bid on exciting and unique items during live and silent auctions. Cancer Services’ Design on Life Auction has been held as a prelude to the Fort Wayne Home and Garden Show since 2004, raising more than $460,000 to help provide practical resources and compassionate assistance to families in our community that are touched by cancer. Individual tickets are $50; $600 for a Reserved Table of 10. Each event ticket purchased includes a complimentary ticket to the Fort Wayne Home and Garden Show. 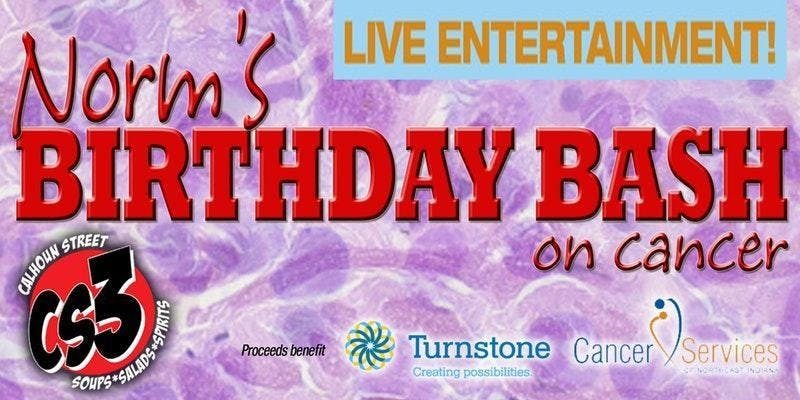 Purchase tickets online at: https://cancer-services.org/what-we-do/events. If you would like more information about the event or are interested in being a sponsor, please contact Keiara Carr at kcarr@cancer-services.org or call (260)484-9560. Support Cancer Services while you shop online! 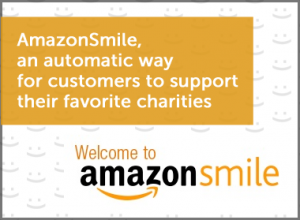 Support Cancer Services of Northeast Indiana while you shop at smile.amazon.com. Amazon will donate .05% of eligible purchases to Cancer Services of Allen County (our legal name). All you need to do is use this link: http://smile.amazon.com/ch/35-0965609 (bookmark it so you can keep going back) and make your purchases as you normally would. Cancer Services will use the money we receive from your Amazon Smile purchase to pay for needed programs and services for people in our community who have cancer. Please save and share this link with your family and friends. It’s a great way for you to support Cancer Services with the purchases you are already planning to make! Visit https://www.kroger.com/asset/vn_18694ca0c0178c6c5ece8511e00007ae/central_faqs for more information. Join us for lunch on the fourth Friday of each month! 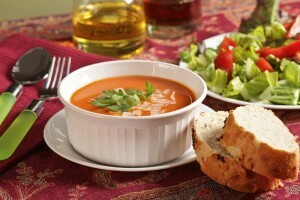 Friends 4 Lunch is designed for those interested in learning more about Cancer Services. It includes a light lunch, tour of our building, and time to ask questions. We value your time, therefore, the program will last one hour. Please contact Stacey Stumpf at sstumpf@cancer-services.org or 260-484-9560/866-484-9560 to make a reservation! By enrolling your Kroger Plus Card into the Community Rewards Program, Cancer Services will be able to receive a quarterly donation from your purchases. Last quarter, we were awarded nearly $600. A donation of this amount can help assist a client pay for pain and nausea medicine. Ensure the “View By Type” filter is set to “All.” Type in Cancer Services of Northeast Indiana in the search bar or use our organization code: CW868. Click “Enroll” and you’re good to go! 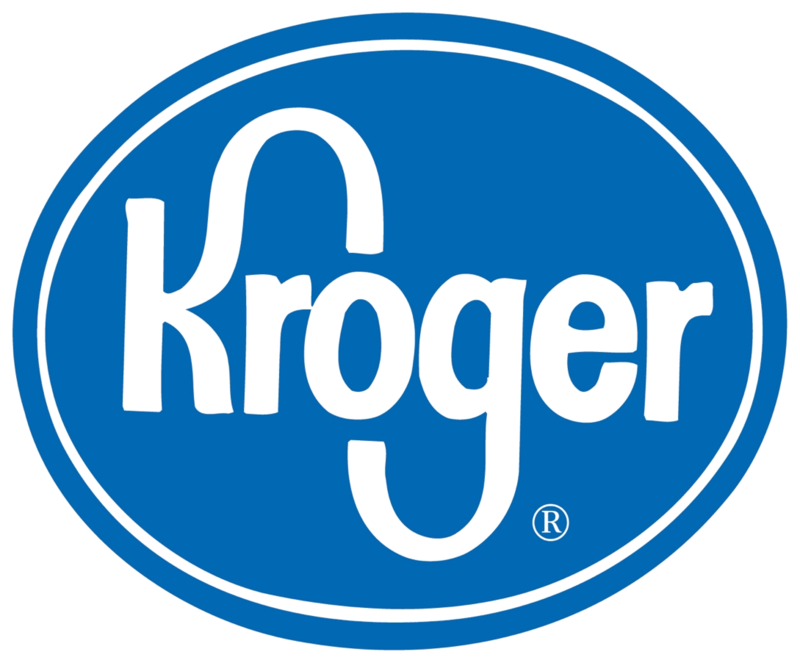 You will immediately begin supporting Cancer Services the next time you use your Kroger Plus Card.